Oct. 18, 2016 - John Deere has introduced the 2154G/2156G and 2654G/2656G Forestry Swing Machines. Designed to increase operator efficiency and performance, the G-Series machines can maneuver through the toughest of jobs, from loading to processing big wood. Much like the large frame machines, the 2156G and 2656G Log Loaders are distinguished by the 56 model number, while the Forestry Excavators retain the 54 model number. All four models are equipped with a powerful PowerTech Plus 6.8L engine. On the 2154G and 2156G models, the new engine reduces fuel usage by 5 to 8 per cent. The G-Series machines include a variety of features to increase operator comfort. The climate-controlled, redesigned operator cab is much larger and quieter than the predecessors, and is equipped with ergonomic controls, excellent window clarity and isolation mounting, boosting operator productivity from dawn to dusk. 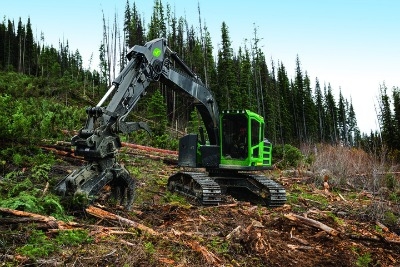 The Forestry Excavator models feature a standard 25 percent larger side-entry cab, while the Log Loaders/Processors have a standard elevated rear entry cab, which allows for safe and easy entry and exit. A cab-forward option on the 2156G and 2656 Log Loader/Processor models boosts operator confidence, providing excellent visibility particularly when swinging toward the boom side of the cab. The LED options on all models expand the lighted area, providing crisp, clear lighting for improved visibility and safety. The design on the G-Series machines features significant undercarriage improvements. The 2154G and 2156G models have been updated with larger rollers, while the 2654G and 2656G are available with an optional longer track, improving machine stability, increasing operator comfort, boosting machine lift capacity and extending lower roller life. Improvements to the boom, arm, mainframe and undercarriage increase the life of the structures. To simplify service, the G-Series models feature a 35 per cent reduction in electrical components, helping to reduce electrical-related downtime. The machines are equipped with a larger cooling system with hydraulically reversing fans to increase airflow and lower operating temperature. Additionally, ground level service access, conveniently located filters and test ports, and LED service lights simplify routine maintenance. All of the G-Series machines can be combined with JDLink, the John Deere machine monitoring system and remote diagnostics service. Owners and operators are able to easily maintain their machines at peak performance levels, ensuring productivity, uptime and longer machine life. Even from miles away owners can monitor their machines, tracking machine health, managing hours and identifying maintenance needs. To learn more about the entire line of G-Series Swing Machines, including the large frame 3154G and 3754G Log Loaders/Processors and 3156G and 3756G Forestry Excavators, visit www.JohnDeere.com, or contact your local John Deere dealer.